You’ve decided to move out on your own, congratulations on your big step! Life teaches us lessons and some we don’t learn until we move out on our own. 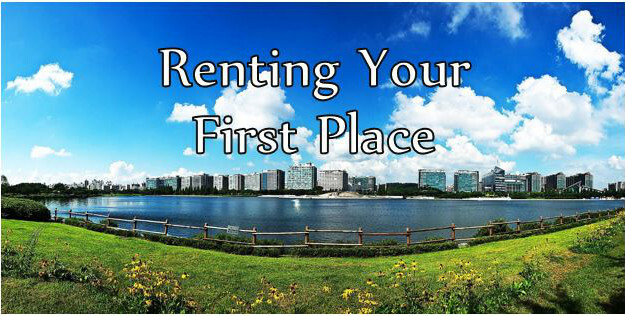 Here are a few tips for first time renters to consider. Location, location, location. Think about where you want to live. Perhaps, you don’t drive and need public transit, you will want to make sure that you’re close to bus stops or areas you go frequently. Look at places in your budget. If you’re moving out by yourself make sure that the rent suits your budget but also leaves you room for any emergency fees, groceries and bills that may/will come your way. A rule of thumb for budgeting housing expenses is that your rent or mortgage, utilities and property insurance shouldn’t exceed 40% of your income. Ask about fees long and short term. This can include things like security (damage) deposit, pet deposits (not all places allow pets – be sure to ask), utilities etc. When considering moving into an apartment building check to see if there are move in/out fees. If you take care of your place, you should get most if not all of your deposits back. Leases. 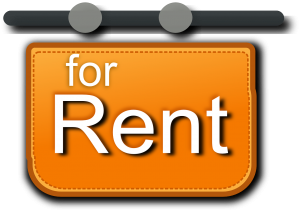 When you rent you will have to seal the deal with a lease, this may be done verbally however is far better to have it written down. Why? 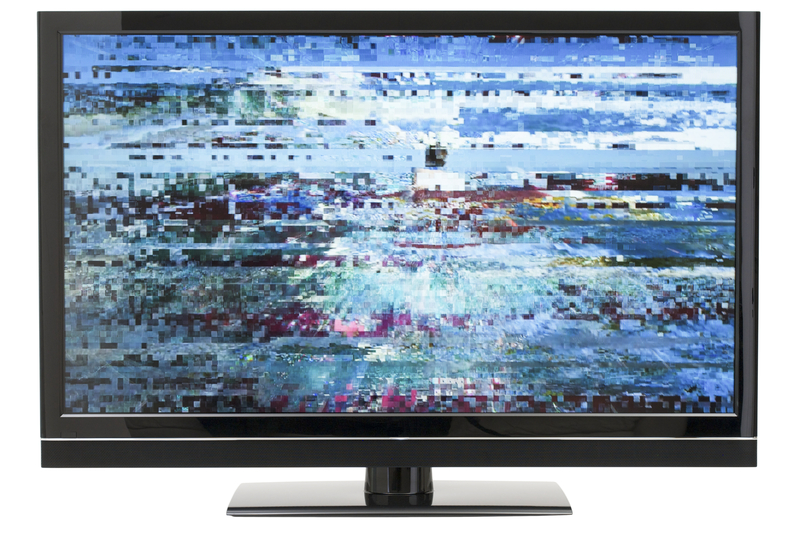 As a tenant, you could be held legally responsible for things without being aware. Which makes for some nasty surprises when you move out. Without a written lease people can make things up as they go along. Why leave things to chance? If it winds up in court you could find yourself paying for things you didn’t expect. Types of Leases. There are two types of residential leases in Alberta; month-to-month and fixed term. A month-to-month lease is a continuing lease that ends when either the landlord or the tenant ends the tenancy in a manner provided under the Residential Tenancies Act of Alberta. Term leases can be for any specified length of time, but the most common in Alberta is a six month or a 1-year lease. Tips to Remember: If you don’t plan on moving and want to protect yourself from a rent increase ask for a longer term lease like 2 or 3 years. If you are a student and are planning to move home after the school year is up ask the landlord if they will give you a term lease that matches your school year. 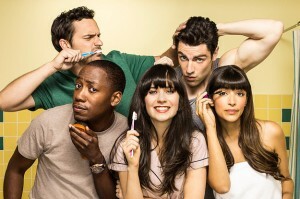 Roommates. It’s a nice thought to move in with a friend. If you decide to do this make sure that all of your names are on your lease, this will make everyone accountable for their share of the rent. Make an agreement with your roommates about chores, visitors, pets etc. to prevent any arguments or personal bubble invasions that may arise. Don’t forget your renter’s insurance. Most landlords will require tenants to have insurance. If yours doesn’t, consider getting it anyway – it will help in case of emergencies such as fire, theft etc. If you drive, you may be able to bundle your tenant insurance with your car and/or life insurance! Organizing & Packing. When moving into a new place it’s a good time to declutter, why pack things you don’t need? It’s more items to collect dust and more work for you. 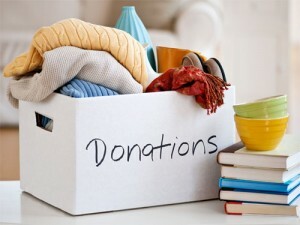 Carefully go through your items and decide what you need and store, donate or trash the rest. Check out our blogs on the Truth about Staying Organized and Small Storage for tips on decluttering and solutions to store smaller items that won’t fit in your apartment or condo for a fraction of the cost. Moving day. Arrange for a moving truck and some extra hands to help move your things. Moving day can be exhausting, so budget for pizza and paper plates. This way you won’t have to cook or do dishes your first night. One thing I seem to always have tucked into different places are rolls of ribbon. 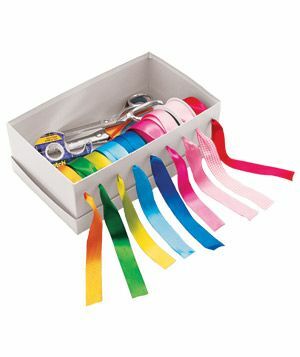 Here’s how I organize the ribbon. My first choice is taking a wall mount paper towel holder and removing the wooden rung that would go inside the roll. 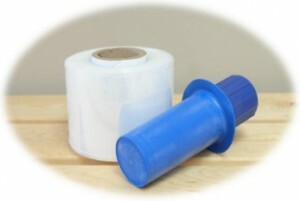 Now you can slide on all your ribbon casings and hang them in plain view ready to use. The second way is to use a shoe box and some doweling. Cut your doweling to the length of the shoe box. Slide one end into a hole you have cut on either end to hold the dowel in place. Next, add your ribbons and then push the dowel through the second hole. To keep things really stashed away you can use the lid and cut small slits in the top for the ribbon to run through. I prefer to keep the box open so I have a better idea of when I am getting close to the end of the roll. If this storage box is going to stay out in plain sight you can make it look less like a shoe box by covering the outside with a nice bright wrapping paper. 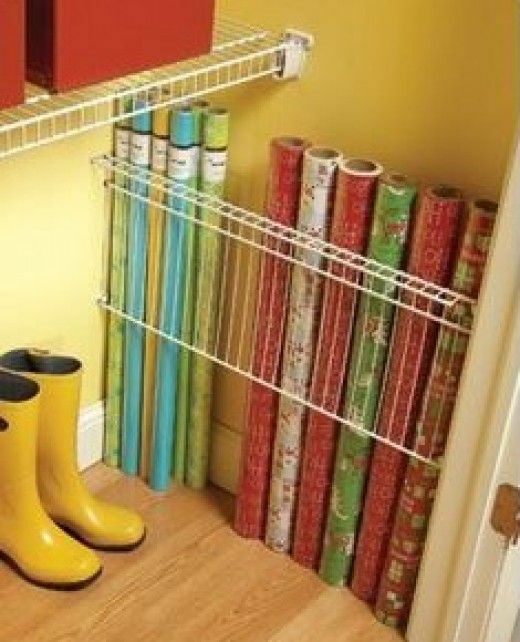 The side of a closet makes a perfect hiding spot for all the rolls of wrapping paper. The easiest way I have found to reign in all those rolls is done with a piece of wire closet shelving used in most homes. Simply measure the side of the closet wall and have the store cut the shelf for you. Using the braces for the shelving attach the shelf vertical instead of horizontal leaving just enough space between the wall and rail for your wrapping paper roll to stand up without leaning over. 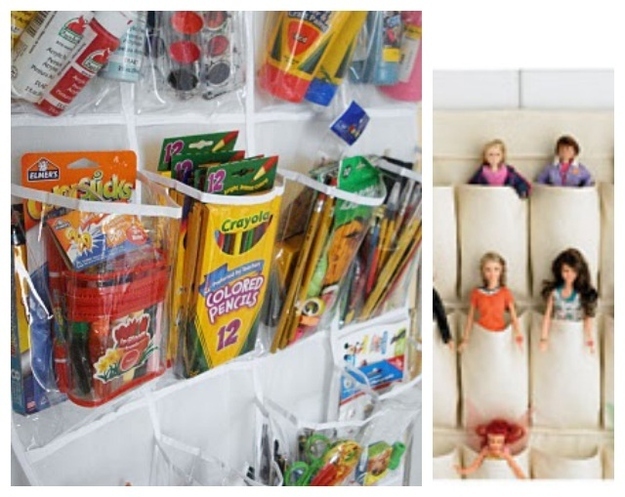 A plastic hanging shoe holder on the back of a storage room or closet door makes a perfect place to store objects such as your glue gun, scissors, etc. This way you can clearly see the craft supplies you are storing, get easy access to them, but still keep them out of sight. Another smaller storage idea I use is to place all my small breakable or damageable items inside an egg carton or a fishing lure box. There are cubby holes for safely placing little bows, and any delicate tool or craft supply. It’s hard to keep our New Year’s resolutions. In fact, now that it’s the end of January those New Year’s resolutions may already be in the review mirror. 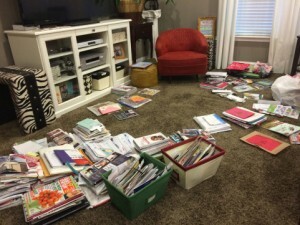 Was one of those resolutions to get organized and stay organized? There’s a lot we pack into each year, and for that reason a nebulous goal of “getting organized and staying organized” may be hard to achieve. Don’t give up! Here are some smaller goals that are easy to achieve that will help you reach that ultimate goal of being organized. Goal 1. Categorize your stuff. Categorization allows you to concentrate on each group separately. These categories should include things we must keep such as: tax forms, bank statements, and home records. Other categories can be things we like: books, clothing, cables, and gadgets. Categories can even be more specific, if you have a hobby hoarding problem. Puzzles, board games, photo albums, and sports equipment are all examples of things that can easily build up in your home. If you notice anything taking up too much space, it needs a category of its own. Goal 2. Box it up if it’s not your everyday stuff. One key step on the road to an organized life is to get your stuff into storage boxes. Label the boxes by category and sort your belongings into the appropriate box so you can find things at any time. Date the boxes. Dating storage boxes is handy for many reasons. For dated documents it lets you know when you can destroy them. For family photos and heirlooms it gives you an archival date of when these things were last viewed. For other items, if the box remains sealed after a year it may be a signal that you don’t really need that stuff and should let it go. One extra step to take with breakables — include a bold “fragile” warning so you will handle those boxes with care. 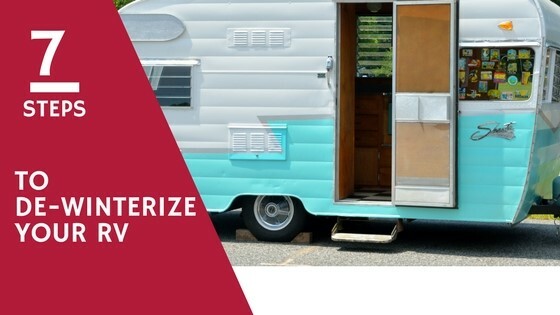 Want to know a secret to taking some of the stress out of moving? Plastic wrap! Plastic wrap (also known as stretch wrap) is one moving supply that you shouldn’t skip. It’s a great way to protect your furniture from scratches and scuffs. Also, use it for wrapping things that are hard-to-pack like rugs, furniture, and bed rails. And, because there is no adhesive on plastic wrap there is no sticky residue left on your furniture. Here are some other stretch wrap tips from our moving experts. The trick to using stretch wrap is to be generous with its use. A single layer of plastic wrap isn’t effective. But three or four continuous layers of wrap seals things shut and offers protection from the bumping and jostling that can damage your belongings during a move. Here are some other stretch wrap moving hacks from our moving experts. Stop packing things that are in drawers. Keep everything in the drawer. Wrap with three generous rounds of plastic. This seals off the tops of drawers and gives you an instant moving box. No packing or unpacking required! Do you have furniture with cabinet doors, like an armoire or china cabinet? Wrapping doors shut will save on dings and scratches. Cut down on tripping hazards by wrapping appliance cords securely to the appliance. Use stretch wrap to bundle together related items like bed rails and the assembly bolts. Before you do this, take a picture or two of how everything goes together. Having a picture to refer to saves set up time. Stretch wrap over all the connecting cables for your electronics. Before you unplug everything, take another quick picture so you know where everything plugs back in. For this last tip, I prefer Press and Seal to stretch wrap. To keep jewelry from being tangled. Tear a large strip of Press and Seal and lay in on a counter or table sticky side up. 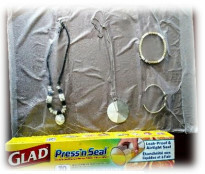 Organize your jewellery on it then place a second sheet of Press and Seal over top. Press down around the individual pieces of jewellery to seal each piece in its place. You can then roll up and store this jewellery pack without having a tangled mess greet you on the other side of your move.